Email IrishArstIndy@gmail.com to reserve seats and receive directions. 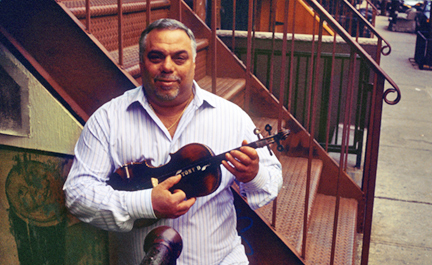 Tony DeMarco: Irish fiddler. If that sounds slightly off, you have only to listen to the music on any of his recordings to be cured of any preconceptions about the importance of ethnic purity in traditional music. There may have been a time when Irish music in New York City was played exclusively by Irish immigrants and their offspring, while their Italian neighbors strummed mandolins and sang opera. But the Big Apple really is a melting pot. By the 1950s, this kind of ethnic mixing was fairly normal in Tony’s native Brooklyn, where the Italians and Irish lived side by side and attended the same parish churches. More typical young Irish traditional musicians in New York in the 1970s had at least one parent born in Ireland.. They would have joined a branch of the international Irish traditional music organization Comhaltas Ceoltóirí Éireann and competed each year at the regional fleadh cheoil at Manhattan College in the Bronx. According to Tony, “I came through the hippie scene, the folkie scene.” He tells the story of how he took up the fiddle and discovered Irish music in his own contribution to these notes, but it is worth repeating here that his first exposure to Irish traditional music was through a Folkways recording of the County Sligo fiddler Michael Gorman. Tony had many other musical influences before this, and would have many more afterward, but for him the appeal of the Sligo fiddle style would never fade. Come join us for, what's sure to be, an enjoyable evening of music, stories and merriment, with the dynamic, Tony DeMarco!